Licensed with special permission from the author, Janet Munsil, she writes ?Congratulations on the 100th season! I'm delighted to be part of it.? 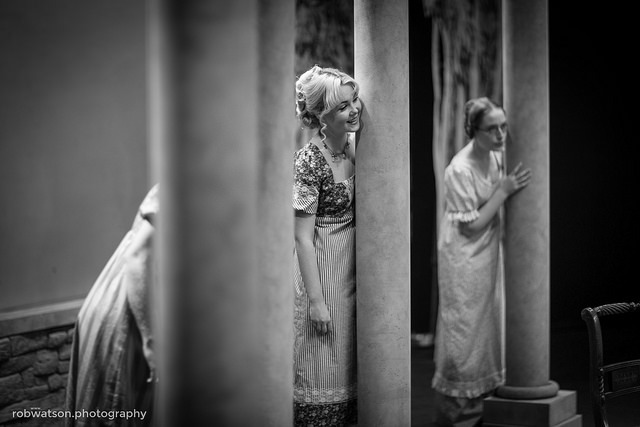 The wildly romantic world of Regency England is brought to vivid life in this sparkling new stage adaptation of Jane Austen?s classic tale of love, family, and the politics of marriage. When the independent minded Elizabeth Bennett meets the enigmatic Mr Darcy, her opinions on marriage are profoundly tested. Can he overcome his pride and she her prejudice to make an ideal match in a society where social standing outweighs personal feeling? Critics describe Janet Munsil?s adaptation as ?Funny, fierce, romantic…undeniably engaging?. Dancers: Paul Wilson, Rose Wilson,?Craig Barrett, Crystal Toth. FINE dresses, fluttering fans and women who live to land a handsome, well-heeled husband. 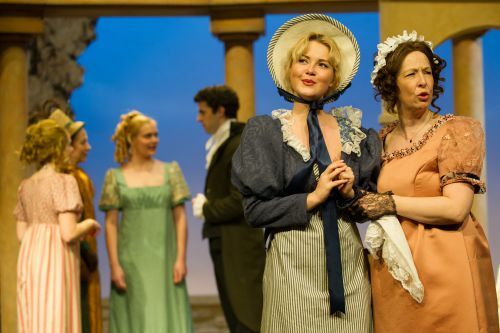 Welcome to the world of Jane Austen, recreated on the stage of Altrincham Garrick this week in Janet Munsil?s perfectly paced adaptation of the classic novel. Personally, I?ve never been able to work out if Austen loved or simply tolerated a world that often seems shallow and superficial. It is remarkable though, how fresh the dialogue sounds, moments of wit punctuating the drab society small talk. 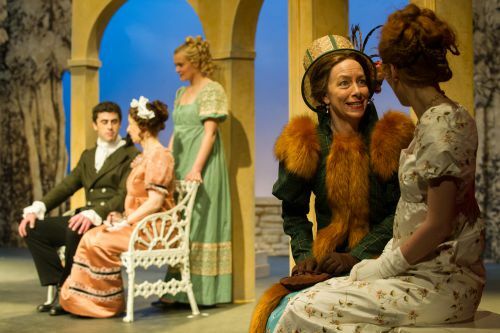 Laura Whitehurst, pretty and elegant, is particularly impressive as Lizzie Bennet, the heroine of the piece and Laura particularly shines during the scenes in which she fends off the romantic attentions of the boring as hell clergyman Mr Collins. I?ve watched Adam Gonet grow as an actor and he plays this part really well. Collins may be incurably dull but Adam manages to make his character, who has a very unique dancing style, rather lovable. 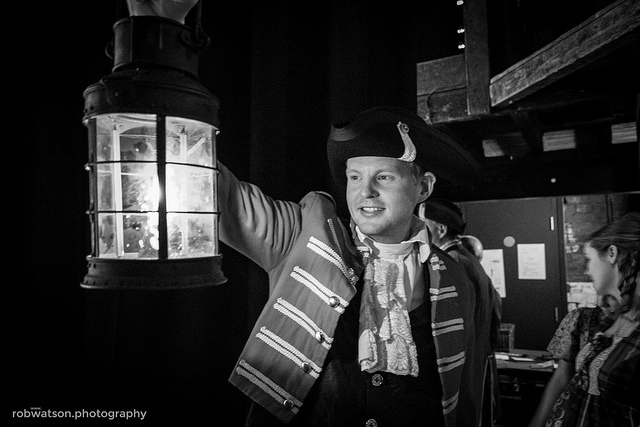 Colin Firth immortalised the Darcy role on the big screen and Anthony Morris cuts a dashing figure in the Garrick production, with Anthony bringing a quiet charisma to this most famous of roles. One of the best performances of the evening comes from Jacqueline Wheble as Mrs Bennet, forever flustered and trying so hard to make sure her flirty, gossip craving daughters stay on the straight and narrow. Add a lovely set and you have a highly watchable evening of escapism, with a few laughs along the way. 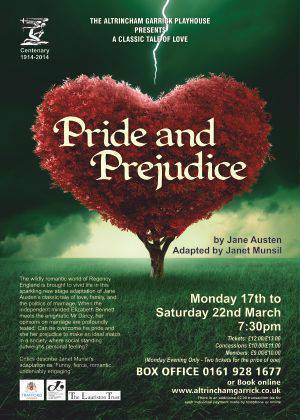 It?s over 200 years since Jane Austen?s Pride and Prejudice was written but the version presented at Altrincham Garrick Theatre is less than two years old. 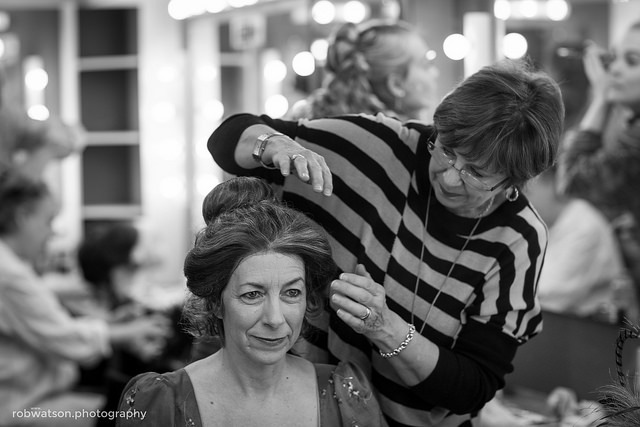 Janet Munsil?s revival was commissioned by Theatre Calgary and the National Arts Centre, Ottawa in 2012. Whilst sticking to much of the original, Munsil makes the classic accessible to modern audiences. It?s about the Bennets who in the age of elegance in Georgian England, believe it imperative that their five daughters are married off to wealthy suitors. Mr Bennett and his wife, played warm-heartedly and with great humour by Martin Oldfield and Jacqueline Wheble have pressing financial reasons to get their girls wed.
Eldest daughter Jane (an amiable Susie Chrystal) soon becomes acquainted with the wealthy Mr Bingley (Stuart Billson) who moves in next door and they quickly tie the knot. 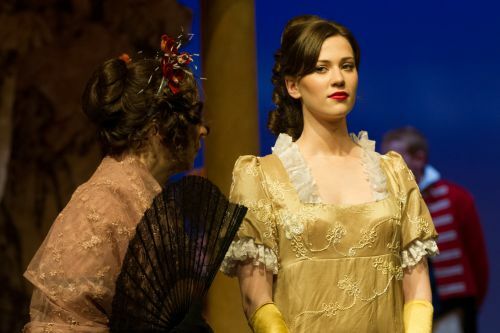 But that is after the family are disgraced when another daughter, Lydia (Rachel Mayon), runs off to Brighton with the disreputable George Wickham (Daniel Ferguson). But Lizzie, the strong-minded, opinionated second daughter played by a feisty Laura Whitehurst, is not so easily trapped into matrimony. 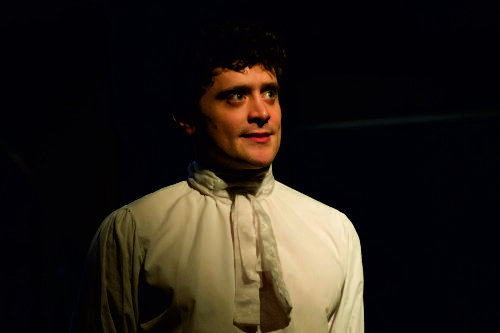 She is repulsed with Mr Collins, an uncouth clergyman, played charismatically by Adam Gonet who, in an amusing scene, attempts to woo her. We wonder, will she or will she not, succumb to another proposal by the charming Mr Darcy? Anthony Morris portrays him as the strong, silent type who finally breaks through the barrier he creates. What I really like about this production is the way it captures the attitudes of a time when women had few rights and whose fortunes relied solely on their men folk. Yet often the women in question use feminine wiles to get their way. There are some lovely ball scenes which in themselves convey attraction between the sexes. The costume department deserve praise for the regency clothes of both sexes and the inconspicuous scene changes ensure smooth delivery. 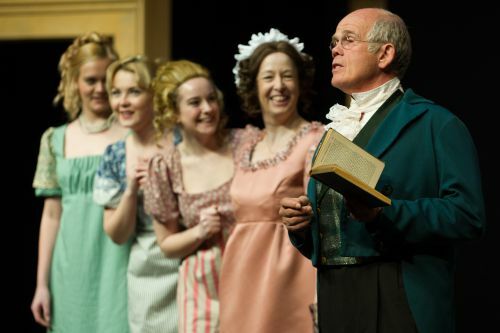 As we?re vastly approaching the 100th season finale, the Altrincham Garrick presents this classic Jane Austen drama. You can certainly see with this piece just how Jane Austen (the godmother of the rom com) has inspired so many writers, needless to say that these classics have helped shape so many flicks of today. This productions design was very picturesque; the collection of arches conveyed the grandeur the piece needs, I liked that the set was fairly minimal and static throughout which erased any unnecessary fuss which often accompany period pieces, the design cleverly helped to divide the space when it needed to and the lighting was finely coordinated to credit the stage design. I?m sure that (sat directly behind me) was the Austen-mania fan-club who seemed to get overly hyper with excitement whenever ?Darcy? made an entrance, one of the Gents in the party felt the need to inform us all that he?d spotted ?Darcy? with a; ?Ere ?e is!? each time he walked on ? which I must admit did get a little tiresome mid-way through the second half. Laura Whitehurst as Lizzie is strikingly beautiful and can certainly portray excellence on stage though I felt this character?s wit and mischief was missed. 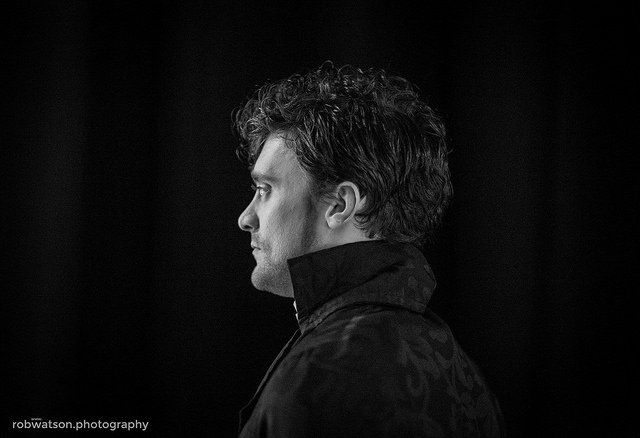 Actors are often taught to regularly watch themselves perform (in a mirror at rehearsals or on a recording) ? Laura is an intense performer and often has a very serious and taut expression which gives the impression she?s not relaxed and for a role such as this, it made her performance and character quite a challenge for me to engage with. There were some lovely touches of direction with innovative and interesting staging choices which appropriately complimented this revival, I particularly appreciated moments which had been included to feature the casts obvious physicality ? rather than ignore the vast height difference between Charlotte and Mr Collins it was cleverly highlighted which resulted in some welcome humour. For a period piece - and keeping in mind the usual standard and expertise in this companies costume department? - I was expecting more of an impressing collection of costumes. The gentlemen donned dinner jackets in scenes that were set during the day and the vast majority of the cast (including main principals) had one outfit each for the shows entirety. I was stunned when Mr Darcy made his first appearance - which I cannot overlook - in a pair of terribly creased and crumpled trousers.? This was either some unfortunate oversight or an act of carelessness but none the less, it?s highly unforgivable and embarrassing for the aristocratic lead in a period piece (which just happens to be the most iconic and suave of Austen?s characters) to enter dressed like a tramp. 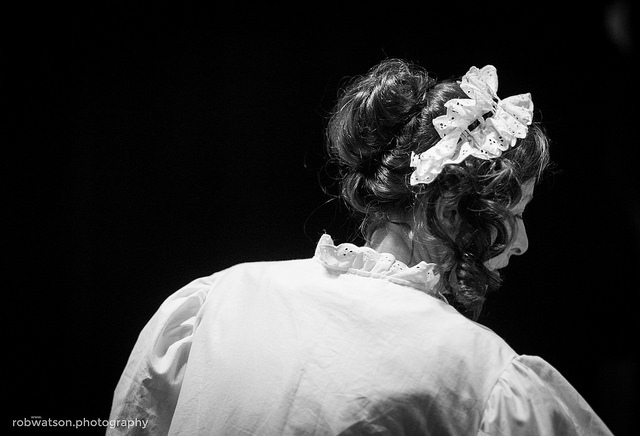 Rachel Isbister as Caroline Bingley had spark and charisma in her scenes, I?d go as far to say that her interpretation and delivery was the most interesting and engaging, however, her make-up (whether deliberate or not) stood apart from the rest and looked too modern.? 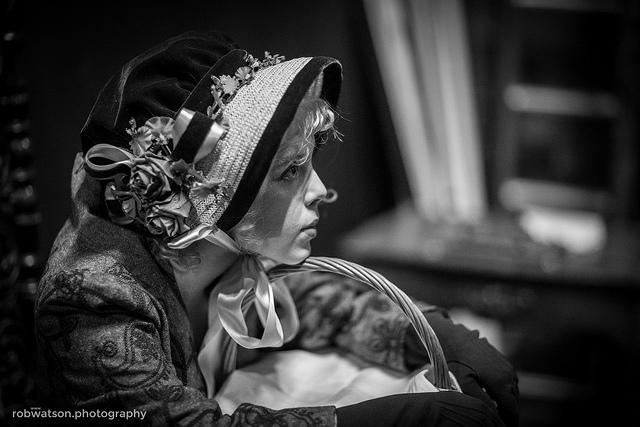 ?Jane Bennet, played by Susie Chrystal, and George Wickham, played by Daniel Ferguson were both particularly good, it was a shame both their roles were as short lived as they were. Anthony Morris took the role as the regency heartthrob Mr Darcy, a role which is somewhat difficult to pull off; to portray a balance of ?romance? and ?arrogance? 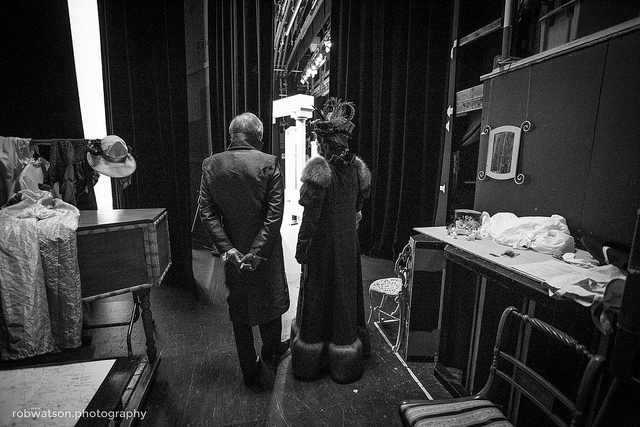 without one overpowering the other is incredibly difficult to convey and Anthony certainly put in a worthy shot. I appreciate that being able to present this piece requires a strong forte amongst the companies younger membership, casting such plays cannot be easy though I couldn?t help but feel that Stuart Billson (as Charles Bingley) and Adam Gonet (as Mr Collins) would have been more enhanced if they had been given the opposite roles; I couldn?t take to Stuart in his part and didn?t feel he particularly suited this type of character whereas Adam , who certainly did a creditable job, I feel it would have been far more realistic if they?d have been switched. This piece requires a large cast and, understandably, a few players doubled up on roles ? 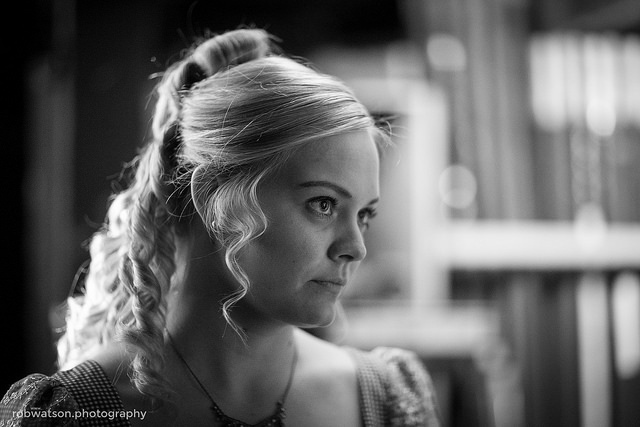 a creditable mention must go to Annabel Butcher who most successfully transformed herself from Mary to Georgina, she was almost unrecognisable. 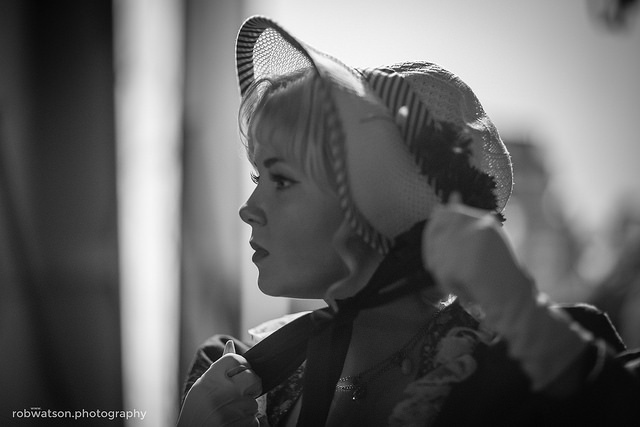 Celia Bonner?s sly control of Lady Catherine?s temper in the later scene also scores points. 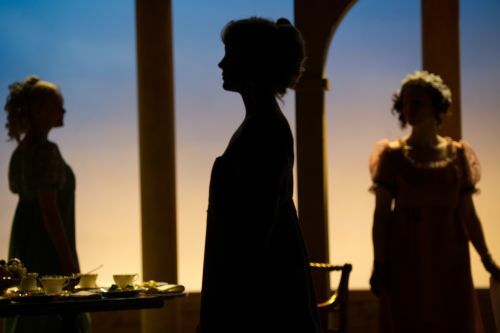 I came to see Pride and Prejudice last night and felt that I must write as it is amongst the very finest productions I have seen in the countless years I have been attending the Garrick. Costume dramas are a genre in which I have found the Garrick are particularly adept at staging, however with this production things seem to have stepped up another gear entirely. It is wonderful to see such young talent on the Garrick stage in large numbers. Of course the familiar faces of Martin Oldfield, a superb Jacqui Wheble, John Westbrook, Sarat Parker Broughton and Celia Bonner - all of whom are quite excellent - are on hand to add further levels of experience, but it is many of the young actors who truly shine through. 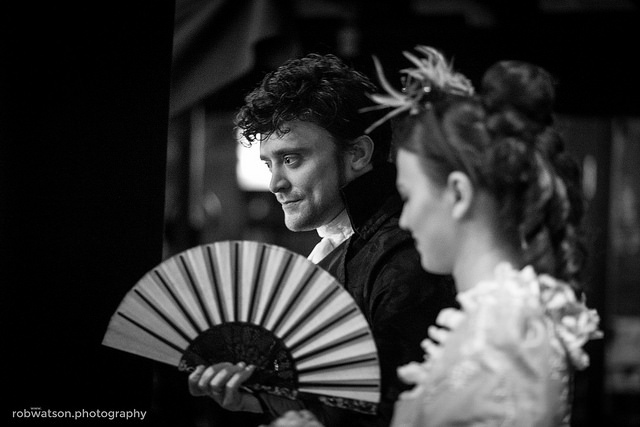 Of particular note, young Laura Whitehurst and Adam Gonet are both quite magnificent as Elizabeth and Mr. Collins (with the latter providing a true comic masterclass), and there are fine turns from (a radiant) Susie Chrystal, Stuart Bilson, Anthony Morris, Rachel Mayon, Jess Brooks, Emily Waldie, Rachel Isbister, Annabel Butcher and Daniel Ferguson (the latter three I am told all make their first appearance on the Garrick stage). Sonia Dykstra's direction is excellent, scene changes are executed with impressive skill and the choreography is delightful. 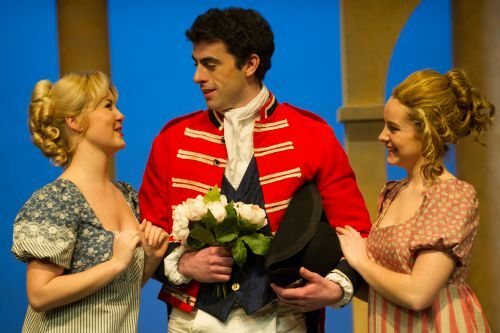 Please pass on my congratulations to the cast on a superb production of Pride and Prejudice. ?The novel has for many years been a personal favourite of mine, having studied it closely since my school days, and I have to say that this production gets everything absolutely spot on. I have known Sonia for a few years now and she always gets the best out of any production. 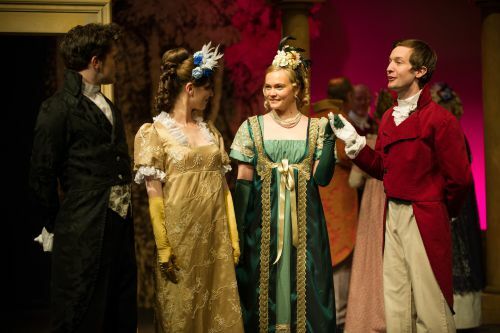 ?The costumes as expected from a Garrick Playhouse show are exquisite and the minimalist set ultimately works in favour of things, never threatening to detract from the action. The music is utilised particularly well and the dinner table sequence was for me a particular highlight of the evening. Again as expected the acting is of professional standard. The reviewer in the newspaper singled out a select few performers and in all honesty I cannot argue with their view. Mr and Mrs Bennett both standout, as do Jane and Mr Bingley, however it is?Mr Collins and Eliza who fully deserve the highest acclaim of the night. The two are indeed outstanding and their scenes together are a pure delight to watch. Mr Collins is incredibly accomplished in ability, stage craft and comic understanding for so young an actor and Elizabeth really?showcases?her high skill as a stage performer. 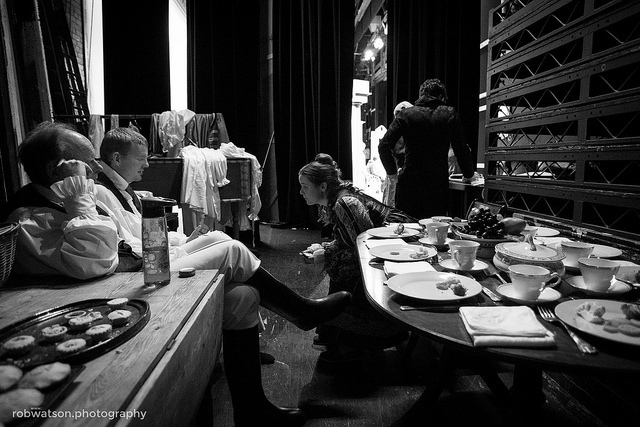 There is a strong chemistry between these two young performers and I only hope to see them paired together on the Garrick stage again very soon. Please pass on this message to the team and I look forward to visiting again soon.